Four close friends launched a small business. After years of losses, and questions about the future direction of the company, one of the partners called me for help. We discussed the options and the challenges they faced. Her involvement, and concern for the business, was beginning to jeopardize her cherished friendships. As much as she enjoyed working with her friends, she realized she needed to make a change. Don’t let money get between you and a good friend. It is wiser to walk away from the money, than to ruin a relationship God provided. 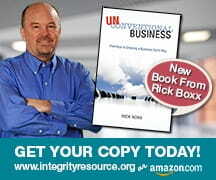 Contact Rick Boxx at www.IntegrityMoments.com.